With contributions from leading experts in the field, Fingerprint Development Techniques offers a comprehensive review of the key techniques used in the development and imaging of fingerprints. It includes a review of the properties of fingerprints, the surfaces that fingerprints are deposited on, and the interactions that can occur between fingerprints, surfaces and environments. Comprehensive in scope, the text explores the history of each process, the theory behind the way fingerprints are either developed or imaged, and information about the role of each of the chemical constituents in recommended formulations. The authors explain the methodology employed for carrying out comparisons of effectiveness of various development techniques that clearly demonstrate how to select the most effective approaches. The text also explores how techniques can be used in sequence and with techniques for recovering other forms of forensic evidence. 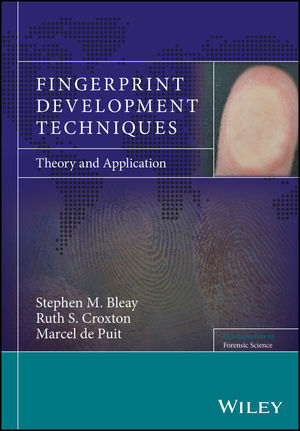 In addition, the book offers a guide for the selection of fingerprint development techniques and includes information on the influence of surface contamination and exposure conditions. Fingerprint Development Techniques offers a comprehensive guide to fingerprint development and imaging, building on much of the previously unpublished research of the Home Office Centre for Applied Science and Technology. Stephen M. Bleay, PhD, Senior Technical Specialist, Home Office Centre for Applied Science and Technology. Stephen has worked at the Home Office since 2003, his work focusing on processes for the visualisation and imaging of fingermarks. He is one of the principal authors of the Home Office Fingermark Visualisation Manual and has contributed to over 40 peer-reviewed articles on fingerprints and related forensic science subjects. Ruth S. Croxton, PhD, Principal Lecturer, University of Lincoln. Ruth has worked at the University of Lincoln since 2002 and is programme leader for the BSc (Hons) Forensic Science degree. Her main research areas are latent fingermark composition and the development of new methods to study them, contributing to a number of peer-reviewed articles in this area. Marcel de Puit, PhD, Senior Scientist, Netherlands Forensic Institute and Associate Professor, Delft University of Technology. Marcel started as a forensic scientist at the NFI in 2007. His main interest is the analysis of fingerprints with the purpose of providing information in other forensic disciplines. He has published over 20 scientific articles on fingerprints and related matter.